If you love a bit of craft and home décor, then let me introduce you to a recently published book that is set to inspire your creativity. 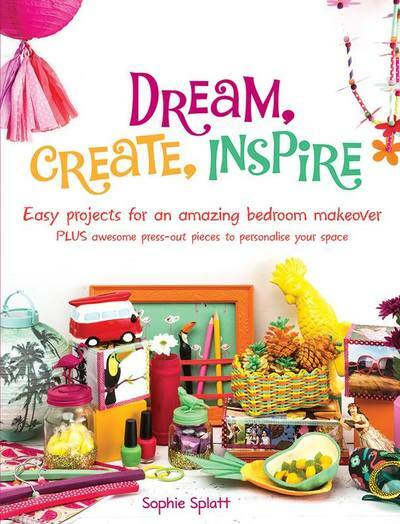 Dream, Create, Inspire, a book by Melbourne-based writer and book editor Sophie Splatt, is filled with colourful ideas to makeover bedrooms using simple decorating techniques that are suited to children aged 7 plus through to adult. 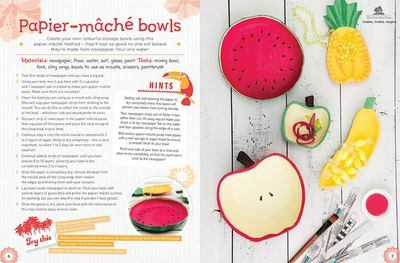 Feast your eyes over the front cover, and you'll get a feel for the vibrant, fun and on-trend decorative ideas you will find inside. a gorgeous pineapple pinecone windchime, which brings nature into the home in a low cost yet effective project that uses a touch of paint. a delightful decoupage chair that breaths a new life into an old furniture piece using decorative paper or fabric. fun animal glitter jars; reinventing old jars by repurposing plastic toys that are painted and attached to each lid. Dream, Create, Inspire published by Five Mile Press, follows Sophie Splatt's successful title Create Your Own Room. Sophie also runs a successful craft business and holds a passion for all things hand-made. You will find easy to follow steps in Sophie's latest book; Dream, Create, Inspire, plus a 16 page coordinated press-out section with templates, photo frames and wall calendars that you/your children can use to decorate with. Dream, Create, Inspire retails for A$16.95, although you can buy a copy from Booktopia for A$14.95* (at the time of writing).